I recently purchased a new razor. I have been using the same kind of razor since I started shaving. My Mom bought me the Schick Personal Touch razor she uses. Now, I have wasted my money on some of the new razors that have come out. The sleek designs and bright colors lured me to buy them but I would always go back to my plain, brown Personal Touch razor. The reason is simple; the other razors just didn't give me the close shave that my original razor could. They were awkward to hold and after the strips of moisturizer wore off the blades, I would get razor burn. I went to Target the other day to buy some blades for my razor. They were out of them so I thought I would just pick up a new Personal Touch razor. My current one was getting old so I thought no big deal. Well, Target was out of the razors too! I didn't want to go to another store but I really needed to shave. I was hesitant to spend money on yet another razor that just couldn't perform. I stood in that aisle for a good 15 minutes before giving in and selecting my purchase. 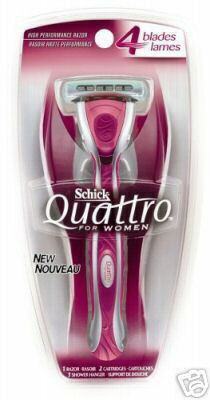 I went with the Schick Quattro. It's a new razor out on the market. As I was taking it out of the package, I was still a bit skeptical but anxious to see how it worked. The sad thing about this post is that the only reason why I am stopping is because Sadie is crying and needs to eat! Here's to smooth legs! Ah, Lindsey . . . You kill me! What a funny post! It's really the first time this morning that I've had a good laugh. Thanks! You are like the 10th girl that has said once you go quattro you never go back-o... or something. I am still shaving with just the Mach3, but why have 3 when you can have quattro? I think that my next big purchase will be the quattro. Thanks Linds! I pretty much just use the cheap Bic razors. Talk about a deal -- it's like 10 razors for $4 or something. Yesssss! I don't really like the word armpit. I don't know why, really. My sister Cami calls the state of New Jersey the armpit of America.